Hello crafty friends what a miserable day we are having. I prefer the cooler weather as long as it isn't raining. I know a lot of you prefer the warmer weather so roll on the weekend when it goes up a degree or two! Today's card is for a special friend whose favourite colour is green. She has items dotted around her lounge in this particular green that I've used. 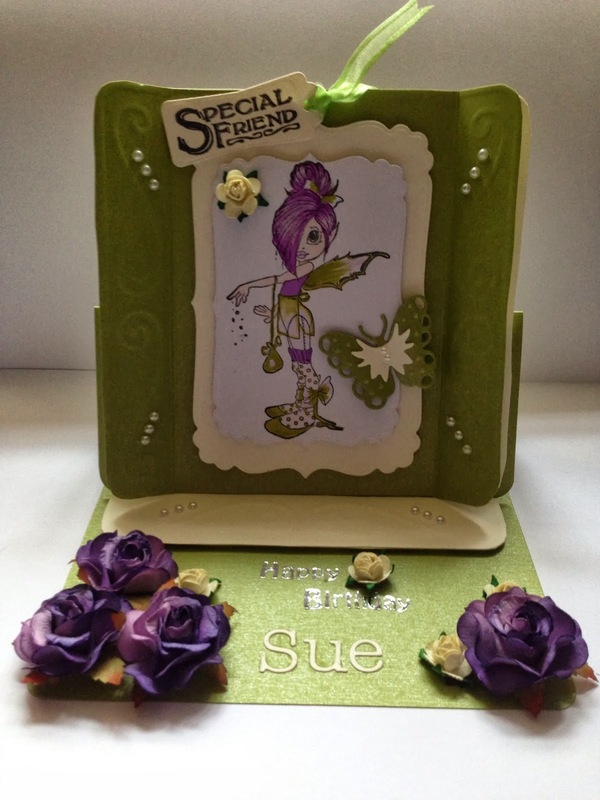 The card is mainly done with the green from Papermill Direct. The cream card is from Millers Diecut. The topper is a Saturated Canary digi stamp coloured with FM's and cut out with X-Cut Fancy Rectangle. (Mistakenly named as Spellbinders Label 29 on other cards....oooops!). The topper is fixed onto a larger cut of the same die then fixed with foam pads onto the easel top. This easel top has been embossed and cut out from a Glitter Girl's Keepsake board. The Special Friend stamp is from an Art Deco set free with a magazine and cut out with a Spellbinders tag die. The butterfly is a Marianne design die. The flowers are from Wild Orchid. The pearls are from Chloe Design. I love reading them all and replying to each one. Great easel card - love the colours. This is a gorgeous card. The colours go together lovely. This is gorgeous Pat, I do love the green and the image is fabulous.